Aged Black garlic is put fresh raw garlic on the black garlic fermentation machine about 90 days, allowed to naturally fermented foods. 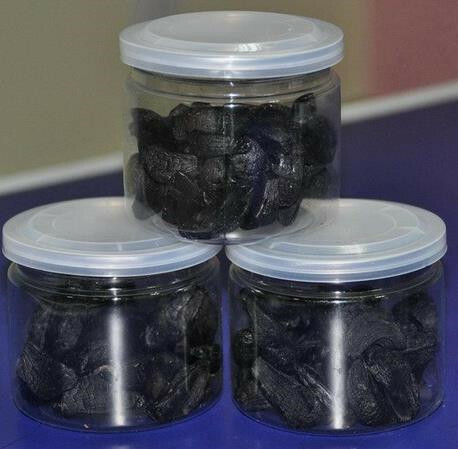 Peeled fermented black garlic is made from white garlic after being peeled and fermented. 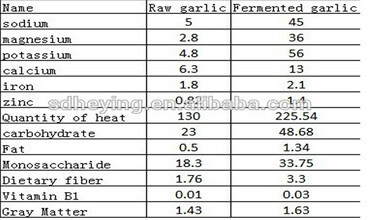 So the composition and efficacy of black garlic and peeled black garlic is the same. 1. Prevent cancer, control blood sugar, strengthen the function of internal organs. 2. Sweet and sour taste, no stimulation. 3. Disinfection, disease prevention wall. Fermented Black garlic, no peculiar smell of garlic, but emenate a rich aroma can evoke appetite. To make garlic granule to keep a lot of water, all of the production process to maintain a moist state, it looks similar to preserved fruit. This is because after a long period of fermentation and maturing , the protein contained in garlic have been broken down into amino acids, carbohydrates are broken down into fructose, and contained intact garlic alliin. Q1. What's your policy on the sample? A: We can provide samples for free, but the customer will pay the freight. A: Generally, we pack our goods in vacuum bags and cartons.We can pack the goods as your requirements! L/C Within the allotted time. A: We chose the white garlic with 5.5-6.5cm to make multiple cloves of black garlic.There are several different specificcations for a single black garlic 2cm,2.5cm,3cm,3.5cm.